Premature babies depend on us as nurses and parents to be their advocates, their protectors, and most importantly their voices. Their development in the NICU should mimic as closely as possible the uterine environment. 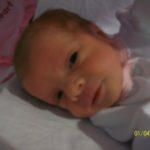 As new parents of NICU babies, it is often hard to understand this concept, and that is when the NICU nurse is your best resource for education about your new baby. As a NICU nurse for 8 years, and also a mother of 5 children, 2 being 34 week identical twins that spent time in the NICU, I have come to see both sides of the very challenging transition that is faced when you have a child in the NICU environment. As parents all we want to do is snuggle with our new babies and offer them the comfort of our touch and our love, because we know that nothing calms a baby more than being swaddled and held by their mother or father. In the NICU that is not always possible, the way that the new parent wants it to be. The NICU environment is often extremely busy, loud, and intimidating to new parents. Imagine what it feels like for the baby who has entered this world long before its brain, senses, and body have fully developed to handle all the stresses of a hectic environment. 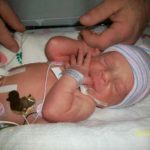 As a NICU mom I knew the environment that I was headed into when my daughters were born because I was lucky enough to have delivered them in the hospital where I work. They were admitted into my NICU surrounded by special friends, who were also my fellow co-workers. My NICU is a single room NICU that offers each baby its own room filled with all the technical equipment to keep a baby safe, but also equipped with environmental advantages to help a baby adjust and thrive in a stressful environment. Each room has shades on the windows to adjust natural light, dimmers on all the in-room lighting to adjust for a calming atmosphere, comfortable chairs where I could relax when spending time with my babies, and temperature control specific to the room for my comfort and that of my 4 pound newborns. What stands out most to me during my stay in the NICU with my daughters was being able to come to the NICU and go to my daughter’s rooms, close the door, and spend quality time with my babies in an atmosphere that was close to a home environment. I was able to pump breastmilk at my daughters’ bedsides while watching them in their isolettes, which is proven to help with milk production, all while in a very private, quiet, and comfortable environment. These little environment pluses helped me and my babies more than you could ever know. Being able to be skin to skin with them in a private and comfortable place helped facilitate the bonding experience that is often not possible with NICU babies. Each mother of a NICU baby deserves an experience like this to help facilitate the mother/baby bond that is so important to make as soon as physically and medically possible. My NICU nursing experience has taught me so many important things about how to deal with my NICU patients and their parents. I strive to offer the best NICU experience to both of them. 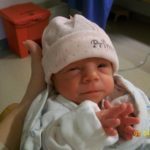 I spend a lot of time educating and explaining to new parents what their NICU baby is going to need from them and a time frame for when each new experience will happen. This tends to lessen the anxiety that they are feeling and it also helps to make them feel like they are involved and have a say in what kind of care their new baby will receive. My biggest goal when I have a new NICU family is to help them to initiate the bonding that they desire. Skin to skin bonding is proven to both benefit the baby as well as the mother and father. The first time a mother gets to bond with her baby, skin to skin, is a magical moment, not to be missed because of NICU environmental challenges. Tracy Whitman is a Registered Neonatal Intensive Care (NICU) Charge Nurse at Moses Taylor Hospital in Scranton, PA. She has been a NICU nurse since 2007, graduating from Pennsylvania State University with her Associates degree in nursing. She continued on to get her Bachelors degree from Pennsylvania State University in 2010. She is currently enrolled at Drexel University pursuing her Pediatric Acute and Primary care Nurse Practitioner degree. She is a proud member of AWHONN where she is participating in the Emerging Leaders Program. She is also a member of the National Association of Neonatal Nurses (NANN), and the Sigma Theta Tau Nursing Honor Society. She was a finalist for NICU Nurse of the Year through the March of Dimes Association. She has recently obtained her Certified Legal Nurse Consultant certification, and is anticipating receiving her certification in Neonatal Intensive Care Nursing in mid-December. She resides in Scranton, PA with her husband and five children. Breastfeeding isn’t just for healthy term newborns. There is a growing body of evidence supporting the many therapeutic benefits of breast milk feeding for preterm and ill newborns. AWHONN’s updated Breastfeeding Support Evidence-Based Guideline, provides a dedicated and significantly expanded section with recommendations targeting breastfeeding promotion and support for mothers of preterm and vulnerable newborns. Nurses, lactation specialists, physicians, and other health care professionals will find the latest recommendations and supporting evidence for this special patient population based on Spatz’ 10 Steps for Human Milk and Breastfeeding for Vulnerable Infants.